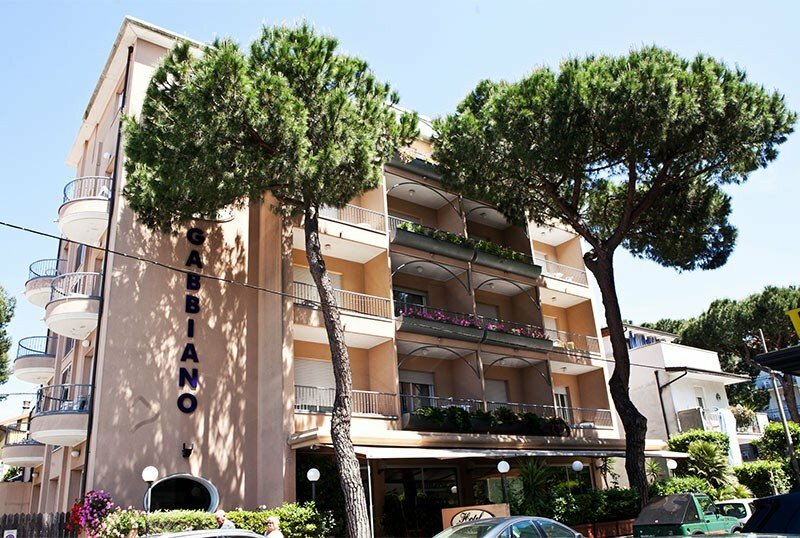 The 3-star Hotel Gabbiano in Riccione is family run and has parking, WI-FI, a shaded terrace and agreements with the beach and discos. The structure is accessible to disabled guests. No pets allowed. The hotel is located in a quiet avenue of Riccione just a few steps from the sea. The beach is a five-minute walk away. With a short walk you can reach the Palacongressi, the train station and Viale Ceccarini. All rooms have a balcony, air conditioning, WI-FI, LED TV 30 "sat and digital terrestrial, electric shutters, mini-bar, safe, direct telephone and bathroom with shower and hairdryer.The rooms are equipped for disabled people. Features a kitchenette and a spa bath. Shaded terrace, TV room, reading room with newspapers, bar, elevator, laundry service on request. Shuttle service to and from airport and free station. PARKING : covered, free, subject to availability. CONVENTIONS : beach, amusement parks, discos, shuttle service, organized excursions on request, restaurants in formula B & B. SERVICES FOR PEOPLE WITH DISABILITIES : entrance located on the first floor with a sloped ramp, a standard elevator, room with wheelchair maneuvering space, wheelchair access shower, shower chair. BREAKFAST : sweet and savory, buffet style, with homemade desserts. LUNCH AND DINNER : choice menu with traditional meat and fish dishes of Romagna, pasta and homemade desserts. Wide wine list. In hotel : strollers, baby sitter service and pediatrician on request. At meals : personalized menus, baby food and seats at the table. On the beach : playground, entertainment, children's pool. The hotel has an agreement with the establishments n. 85, n. 86/87 and n. 90. The beaches are equipped with entertainment, children's playground area, dining areas, cabins, relaxation and reading areas, sports fields for beach volley and beach tennis. At the plant n. 90 there are 3 heated hydromassages, while at the plant n. 86/87 there are two hydromassages and two swimming pools, one for adults and one for children. Use of the pools and hot tubs is subject to charges. - Meals not consumed will not be deducted from the account. - For stays of less than 3 days the price of the room and breakfast is applied. For any meals the cost is separate.